Concrete Services « Interstate Creative Design Corp.
Interstate Decorative Concrete Designs follows the discipline of doing things right the first time. Our professionals are trained in the techniques needed to insure a quality surface and finish. With quality control principles, our technicians assess and provide the best solutions for any decorative concrete project. We treat existing concrete and masonry also installing concrete and masonry products. Designing options vary from tile, random stone to custom concrete etching and logos. 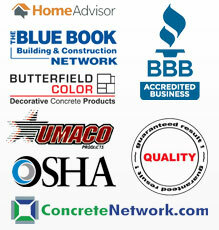 We strive to provide our customers with the best experience during construction. Interior concrete services include concrete polish & staining, resurfacing coloring & designing, interior wall vaneers, electrical radiant heating systems, and interior surface coatings & maintenance. Exterior concrete services include concrete resurfacing coloring & designing, dust-proof masonry walls and exterior surface coatings & maintenance. Click below to learn more about our quality interior and exterior concrete services.